Jell-O has announced their very first Edible Slime product. That's right, you can now eat the slime that you play with. Children and parents are being encouraged to play with their food with two distinct flavors. The first is Unicorn Slime, which is strawberry flavored, and then Monster Slime, which is lime flavored. 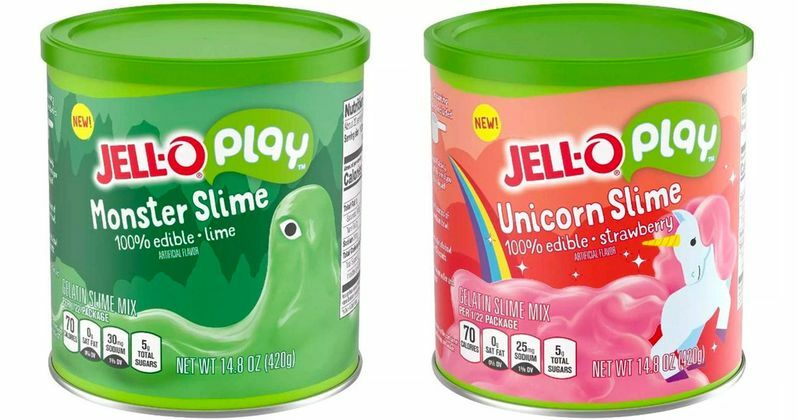 There are currently successful YouTube channels and Etsy accounts dedicated to making slime, but Jell-O Play has announced a completely different beast here: Edible "Monster Slime" which is lime flavored, and "Unicorn Slime" which is of course strawberry flavored. Jell-O Play's Edible Slime is currently up for preorder and will be available just in time for the holidays next month. The idea is to have a product that families can play with, and now eat. However, it doesn't look like a family and children are needed to have fun with the Edible Slime. There are plenty of adults who are totally interested in playing with and eating monster guts...or...unicorn magic? With that being said, it might not be for the faint of heart or people who aren't into spreading germs. As for making it, each container comes with two batches of the Jell-O Edible Slime. You just pour a couple of scoops of warm water into the powder and stir for about 30 seconds. Let it sit for a bit, and you now have the highly coveted Edible Slime. While real slime is usually made with white school glue and sodium borate, Jell-O's is made with modified food starch, sugar, and gelatin, which is totally edible and more than likely delicious as well. It might even be fun to take the two flavors and mix them together for a unicorn monster gut sandwich. Children's slime has been around forever, but it really started to become popular in the 1980s and 1990s. Ghostbusters introduced Slimer, who had a toy that came with slime. But, it was Nickelodeon that took the slime game and elevated to heights never thought imaginable. Then came Gak, which was pretty cool, but not as cool as the straight up slime that kids were used to. Others may disagree, but Gak is just kind of weird and was mostly used to make fart noises. Jell-O Edible Slime is the current product in a long line of reimagining food for children. They previously had a lot of success with the Jell-O Jigglers, which also promoted playing with your food. Kids were able to take cookie cutters to make whatever shapes of Jell-O that they felt like making, play with it, and then eat it. However, the new Edible Slime is a whole new level of weird and instantly intriguing. 2018 holiday parties are about to get a whole lot weirder with the arrival of the Jell-O Edible Slime. You can check out preorder info over at the Kraft Recipes website and get a whole bunch of ideas of what to do with your slime.